Save time when moving or copying files between locations. Attain better business-transaction response times. Dimensions:17.12 x 6.89 x 14.17"
This 2U server rack shelf lets you add 16 in. of flat storage space to any EIA-310 compliant server rack or cabinet. 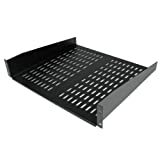 The shelf is vented to improve air flow and help lower temperatures in the rack that it's mounted in. This TAA compliant product adheres to the requirements of the US Federal Trade Agreements Act (TAA), allowing government GSA Schedule purchases. The durable fixed-rack shelf can hold up to 22 kg (50 lbs.) of equipment and is constructed using SPCC commercial-grade cold-rolled steel. Perfect for housing AV (Audio Video) equipment for studio or home theater applications, or network equipment in any office setting. The 2U cantilever shelf lets you optimize your working space by giving you the ability to mount equipment to your rack instead of taking up desk or floor space. Itâs perfect for network equipment in your SOHO (small office, home office) environment, server room or any other location with limited space available. You can install the 2U vented rack shelf in your rack at any height, giving you a stable surface for placing equipment that's un-mountable or storing your tools. The CABSHELFV is backed by a StarTech.com lifetime warranty and free lifetime technical support. Supports Intel 1151 Xeon E processors and 9th/8th Gen. Intel Core/ Pentium/ Celeron processors Supports DDR4 ECC & non-ECC Un-buffered memory 4 PCIe x16 slots for multi cards, support for AMD Quad-GPU Crossfire and 4-way AMD Crossfire technologies Dual Intel Server GbE LAN support Intel vPro Technology large storage capacity: 10 SATA3 Ports dual M.2 support Intel Optane Memory Ready next-gen transfer speeds: USB 3.1 Type-A and Type-C connections ALC1220 120Db SNR HD Audio with Smart Headphone AMP and WIMA audio capacitors. Atx Form Factor; 30.5cm x 24.4cm. Dell's servers offer world class system and image commonality and customer inspired usability. The Dell PowerEdge R610 takes advantage of Dell's system commonality; When IT managers learn one system, they have learned the logic required to manage Dell's next generation servers. The logical layout of components and power supply placement enables a simple and straight forward installation and a simplified redeployment experience in the future. 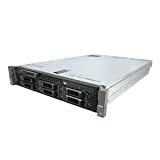 The Dell PowerEdge R610 is a key building block for today's data center. Designed for versatility and high performance, it provides many of the virtualization, system management, and energyefficiency features you need now and the scalability necessary to change as your business grows. Featuring IntelÃÂ½ XeonÃÂ½ processor-based architecture, embedded hypervisors, and expanded memory footprint and I/O, the Dell PowerEdge R610 delivers exceptional overall system performance and significant virtual machine-per-server capacity versus the previous generation. With optional factory-integrated virtualization capabilities, you get tailored solutions?built with the latest technologies from Dell and our trusted partners?which allow you to streamline deployment and simplify virtual infrastructures. 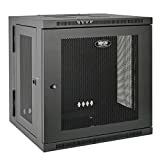 The SRW10US 10U Wall Mount Rack Enclosure Cabinet is designed to integrate wall-mounting, easy equipment access, and cable management in IT network applications with limited floor space. Ventilated front door and side panels allow generous airflow to keep equipment operating safely. Adjustable rack rails with square mounting holes accommodate up to 10U of standard 19-inch rackmount equipment. Supports up to 140 lbs of equipment. A sturdy hinge between the cabinet and the wall-mount bracket allows the cabinet to swing away from the wall for easy access to equipment and cabling. Top and bottom panels include convenient cutouts for cable routing. You want a data center built for organic growth and the ability to scale based on your companyÃ¢s changing requirements. You need complete solutions that let you focus your time and money on managing and growing your business. Dell responds with an expanding portfolio of enterprise servers, storage technologies, and services with a single goal: to help you simplify IT. This server can be configured in many different ways. Please contact us for custom builds, modifications or questions. Normal wear for a USED server. The unit may have minor scuffs or dings that do not affect the function of the server. Our professional custom foam packaging helps to ensure the safest delivery possible. We are a Trusted, Experienced, and Professional Seller! Purchase with confidence knowing that this unit has been carefully tested and will arrive to you in superb working condition! Dell R610 Home Lab Tier 2 - 12 Core 2.66GHz 48GB DDR3 2x146GB H200 iDRAC6 Ent.